In order to explain to you the story of the GTP-13, I must take you back to the year 1968. Back then, as an 18 year old boy, my chosen idol besides the Beatles was race car driver Jochen Rindt. Because of him I grew a passionate interest in motorsports and it’s engineering. At some point in 1968 I stumbled upon a tiny picture of a prototype race car in a motorsports magazine. Source: ALLEN, J.S. Ford GT40. Osprey Publishing, London (1991), p127. ISBN: 1 85532 123 8. 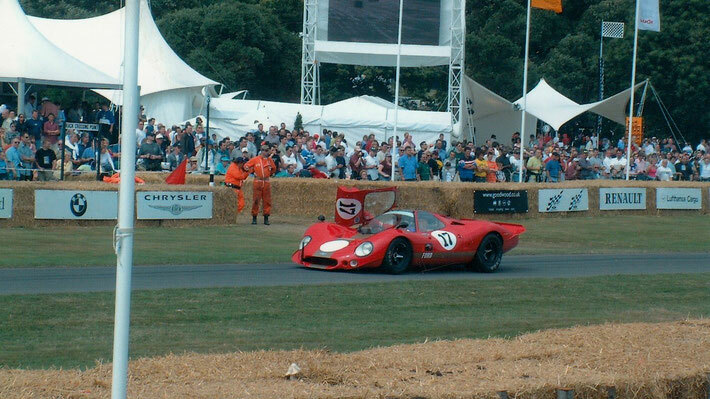 It was the Ford P68 F3L, designed and built to battle the sportscar world championship. To me, the appearance of the car in the picture was the essence of beauty, competitiveness and low-drag aerodynamics. An incredible design! Back in the 1960’s, such cars - the most beautiful racing machines of all time - were built without the use of wind tunnels and computer aided design. Today they are commonly called supersportscars. They will remain cherished and invaluable icons of history! But for unknown reasons, I never saw the Ford F3L again. Thirty-three busy years passed, until I did. I was visiting the legendary "Festival of speed" in Goodwood, England. This event is the annual highlight for high class race cars of the roughly 100 years of motor racing history. I stood at one of the grandstands, when all of a sudden the Ford F3L passed by with it’s roaring Cosworth DFV engine. It was the same mesmerizing sight that I had cherished in my memory for 33 years. There she was, with her unique radiatior scoop, the gull wing doors, the low profile - ducked into the air stream - and surrounded by the hypnotizing sound of her eight furious cylinders. I ran to the pit lane. There I found her, just as if she had been waiting for me all along. A thousand questions I wanted to ask her, I wanted to explain to her my faithful admiration. Her elegance, the sight of her curves, her sent of gasolene and oil, her instruments and wide tires - it felt like I was meeting a long-lost friend. My remaining questions about the car were answered in the following few weeks. Of this incredible piece of art, only three were ever built. An unaffordable dream! The price for one F3L back then was five times higher than the price I would have fetched from selling my own house, which I had built from ground up. All that remained for me of the F3L were scattered bits of information, photos from Goodwood and the internet and some used magazines. But somehow the dream did not vanish. Quite the opposite happened! A few months stood between my son and his diploma in aeronautical engineering. All of a sudden my telephone rang and to a short "Hi dad!" my son added "We’ll build the whole car on our own." This conversation marked the beginning of our work on the GTP-13*. 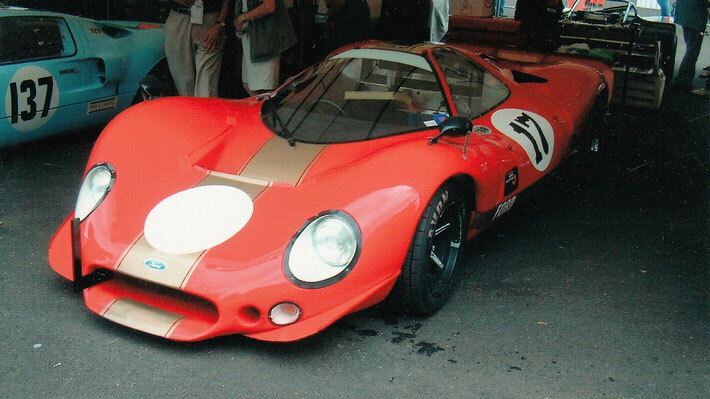 To further understand the GTP-13 story, you need to know that the Ford F3L was unfortunately an unsuccessful racing car. It was denied the time and money to mature. In the few races in which it participated, it even set a pole position. But it could not finish any of these races, mostly due to technical reasons. The following linked page gives you an overview of the car’s racing history. Despite it’s lack of reliability the Ford F3L had one property, that was perfect in every way - its unbeatable elegance in shape. Michelangelo himself would probably have liked it. The shape of the Ford F3L's body is the one thing we took as input for the GTP-13. Everything else - the chassis, suspension, drivetrain, etc. - was newly developed, designed, engineered and built. It consumed all of our spare time for eight years - 8000 working hours in total. We invested roughly 3000 working hours in the design process, which should indicate the magnitude of development that went into the GTP-13. Thus, we think to have achieved a greater technical "maturity" with the GTP-13 than the F3L had. Besides this goal, during the design process we chose to always keep two guidelines in mind: The GTP-13 should have the style of the supersportscars of the late 1960s, and it should be as lightweight as practically possible. To explain the latter, let me cite legendary Lotus design engineer Colin Chapman, who said that "Adding power makes you faster on the straights. Subtracting weight makes you faster everywhere." *...GTP-13 is an acronym for Gran Turismo Prototype 2013. It's design was mostly finished in 2013.